I almost didn’t read this book. Something about the blurb put me off, ‘So when, aged seventeen, Alex is stopped at Dover customs with 113 grams of marijuana, an urn full of ashes on the passenger seat, and an entire nation in uproar, he’s fairly sure he’s done the right thing . . .’ It sounded a bit too clever for it own good, a novel that would be all style with little substance. When it was selected for as a Waterstones 11 title, I put prejudice aside. My assumptions could not have been more wrong. This book has so much substance, it had me sobbing my heart out. I should have known it was coming; the clue is in the urn of ashes, but the tone for the opening half of the novel is light and playful. Alex Woods is a social misfit, a slightly geeky modern teenager. After he is knocked unconscious by a meteorite he finds himself a minor celebrity. Worse his head injury causes him to suffer from epilepsy. Many things conspire against him to make him the school pariah. Bullying inevitably ensues. After fleeing his persecutors Alex finds himself in the back garden of the daunting Mr Peterson. Despite an initial mistrust, Alex and Peterson, strike up an unlikely friendship, brought together by a love of Kurt Vonnegut. Alex is an astute and entertaining chronicler, though much of the humour lies in the things he misunderstands. He is very much a modern Adrian Mole.The book is laugh out loud funny in places, and Alex a wholly likeable character, especially for those of a geeky disposition. Though mostly very different, this book has a number of similarities with Jo Walton’s terrific coming of age novel, Among Others. Both contain eloquent and intelligent social misfits, both pay great tribute to the power of libraries and both narrators owe much to the central philosophies of seminal works of science fiction. (Though it should be stressed neither book requires a love of Sci Fi to be enjoyed). We know from the outset that Isaac Peterson is going to die. Alex’s account of his friends decline, is naive, compassionate and oddly life-affirming. Through his conversations with Isaac and exploring the works of Vonnegut, Alex builds his own moral code. Isaac becomes a father figure (Alex’s own father has been forever absent) which makes what comes next all the more devastating. By making Alex such a logical and methodical thinker, Gavin Extence makes the difficult and potentially unpalatable direction his novel takes, seem not only inevitable, but also wholly acceptable to any right thinking person. 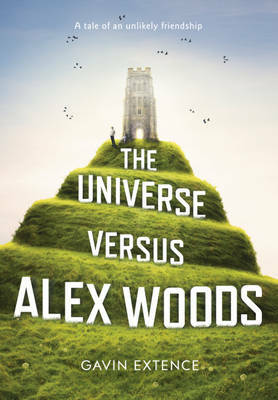 Without spoiling things it’s hard to say just how good Alex Woods Vs the Universe is. It’s quirky and amusing. It’s a humanist meditation on the fragility of existence. It stresses the importance of thinking about our actions and not going with the flow. It will make you want to read Vonnegut, even if you didn’t quite get it the first time. Above all it’s a novel about love and the strength it gives you to make difficult decisions. This novel has had a profound affect on me and I can’t recommend it enough. About ten years ago my Dad was diagnosed with Parkinson’s. Since then I’ve watched him degenerate from a proud man, with the world at his feet, to a frozen twisted statue, locked in a chair desperate to be put out of his misery. Fortunately, these total locked moments are short-lived and irregular, but their frequency will only increase. Isaac Peterson is diagnosed with a similar degenerative illness. At the beginning of February my Dad had a deep brain stimulation operation. The outcome of this is still uncertain, but it could turn the clock back five years. It may be turned back, but it will continue to wind down. In five years time we could be back here again, wondering how to navigate the hideous future that lies ahead. One thing is certain, Dad hopes to finish things himself. He has already talked to me about ‘going to Switzerland’. This is what Isaac does in the novel. The brilliance of it though, is that it’s not Isaac who asks Alex, but Alex who works out it is the logical thing to do, and offers to help Isaac escape his illness. The naivity to Alex’s logic makes his motives unimpeachable. It is impeccable. Whilst I know many people object on religious grounds, from a humanist perspective the right to chose your own death is presented as an inalienable human right. Extence’s arguments are utterly compelling. I was never quite sure about how I felt about my Dad’s wish to choose the time to end his life, and there are still many grey areas, but this novel (combined with a number recent events) has convinced me that I should be there for Dad, should that be what he chooses. But it isn’t that simple. Extence makes (what I assume is) a deliberate choice in his characters. Isaac is alone in the world. There is no wife to survive him, no children who might argue over whether it is the right thing to do. This greatly simplifies the logic. As does making Alex seventeen. He has no dependants. I must confess I haven’t looked into the law in any great depth, (though I accept things on one level, I am clearly in denial) but I believe the current situation is ambiguous. As I understand it, if I had any involvement in assisting my Dad’s suicide at home or abroad, I could face criminal prosecution. At the very least I would be subjected to months of investigation. As a father myself, to three young boys, I simply cannot subject them to this upheaval, and as their primary carer, any time spent in prison would destroy our family. I simply cannot take the risk. I know there are compelling reasons for not legalising assisted suicide, but most of them are rarely used in debates I’ve heard. God, for me should not come into it. If he exists, he is compassionate and we do not know his plan. Gavin Extence’s book makes the inability in this country to choose a dignified end, seem inhumane. The final chapters of this book are stupefyingly beautiful. Alex and Isaac’s trip to Switzerland is told in bold detail. The process is outlined, the safeguards explained, the conclusion sad, yet uplifting. I don’t know what faces my family in the next few years but I do know that Gavin Extence’s wonderful novel has clarified how I feel about one of society’s final taboos.